All eyes are on BOE rate decision which will be published soon. Construction PMI and the Brexit issue will be the influential factors for GBPUSD as well. 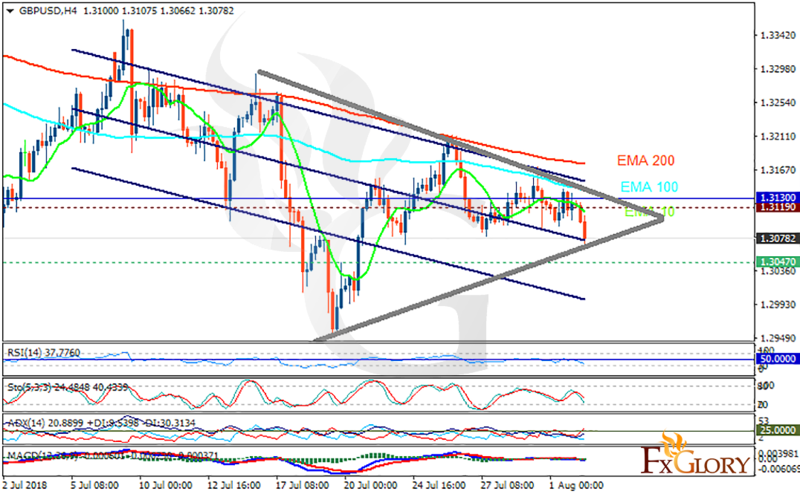 GBPUSD has been moving with less volatility and has created a pennant pattern. The support rests at 1.30470 with resistance at 1.31190 which both lines are below the weekly pivot point at 1.31300. The EMA of 10 is moving with bearish bias in the descendant channel and it is below the EMA of 200 and the EMA of 100. The RSI is falling towards the oversold area, the Stochastic is showing downward momentum and MACD line is below the signal line in the negative territory. The ADX is showing sell signal. GBPUSD will probably decline towards 1.30.